Mary Cassatt was an American painter and printmaker active in France in the late nineteenth century. She was closely associated with Impressionism, and her signature subjects were intimate, domestic scenes of women, mothers, and children. 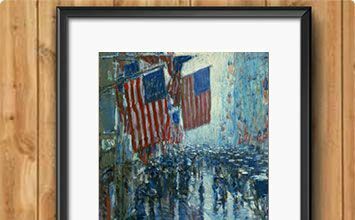 Childe Hassam is one of the giants of American Impressionism - he turned his art into an industry that mirrored the rapid industrialization of America at the turn of the twentieth century. In hundreds of works, he strove to depict both the frenzied pace of city life as well as the unspoiled expanses of nature. William Merritt Chase was an American painter and proponent of Impressionism. Chase brought the then new European style of painting to America, disseminating its methods through his works and his teaching at the Chase School of Art. Chase taught artists such as Georgia O'Keefe and Marsden Hartley. "I think that if you shake the tree, you ought to be around when the fruit falls to pick it up." Like much of the art world, American painters of the late 19th-century were stunned and startled by the dazzling colors and vibrant brushwork of French Impressionism, yet by the century's end, Americans would be among the most passionate devotees of the Impressionist style. Inspired by the novel approaches to painting modern life embodied in French Impressionism, American Impressionism adopted bright palettes and loose brushstrokes to capture the intimate beauty of everyday American life. Whether capturing the natural world or urban energy, the American Impressionists broke with the traditional expectations of academic art to usher in the first popular, modern art movement in America. Although initially many American artists rejected the loose sketchiness of French Impressionism, their eventual adoption of the style ultimately facilitated a revolutionary break from the linear style and classical narratives that defined academic painting. In both style and subject matter, Impressionism inspired American painters to document their rapidly modernizing world with a mixture of curiosity and nostalgia. Combining European sophistication with identifiably American subject matter, American Impressionism quickly became popular among the increasing numbers of upper-class patrons. As American industrialists built private collections of art, they had previously purchased Old Master works to demonstrate their good taste; American Impressionists were the first contemporary artists to be widely collected by Americans. American Impressionism built upon the examples of landscape painting practiced by the Hudson River School and the Tonalists, particularly in the emphasis on immersion in the natural world and an attention to light and color. The Impressionist interest in everyday life and commonplace scenes, however, marked a difference from the transcendentalist visions of earlier 19th-century American landscape painting. The American Impressionists fostered new organizations for the creation and exhibition of their work; these innovations would last beyond the popularity of the style. Many of the artist colonies and exhibition societies that supported Impressionism were critical in broadening American art beyond academic painting. With the end of the Civil War and a new era of American prosperity, the wealthy built large houses to showcase their success. In order to demonstrate their cosmopolitan taste, they furnished these mansions with furniture and art imported from Europe. Although American artists such as the Hudson River School and the Tonalists had developed distinctively national styles, their paintings did not command the prices of European art; American art was not considered fashionable or sophisticated. To become a respected artist, it was necessary for Americans to train in the famous art schools of London and Paris and adopt the academic styles taught there.